After the recent violent crackdown at Letpadan, Bertil Lintner reflects on the historic significance of student protest in Myanmar. Once again, Myanmar has been rocked by student demonstrations and, once again, the authorities have reacted with force, to the extent of using hired thugs in Yangon to beat and drag protesters away. The brutality on the part of the police, who injured dozens during a violent crackdown on student protestors in Letpadan, Bago Region, in March, was condemned by local civil society organizations. But international reaction to the crackdown was limited to expressions of “concern” and, to the dismay of many, pro-democracy icon Daw Aung San Suu Kyi has expressed little or no sympathy for the young demonstrators. Dr. Thein Lwin, a leading figure in the current educational reform movement, was even stripped of his post as a National League for Democracy central committee member in February over a perceived conflict of interest. Regardless of whether or not one sympathizes with the students’ demands for educational reform and more transparency in such matters, it would be wise to take them seriously and listen to their grievances. Anyone familiar with Myanmar’s recent history knows that student-led movements have been harbingers of upheaval and political change. That is to be expected in a country with a long and proud tradition of literacy and intellectual life. In November 1920, students in Yangon protested against what they perceived as unfair university reforms that the British colonial power wanted to impose. 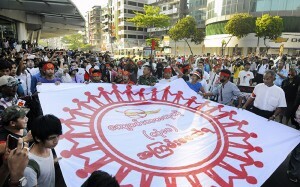 The action gained widespread support and gave new impetus to Myanmar’s independence movement. The day of the “University Boycott,” as it became known, is still commemorated as Myanmar’s National Day, even if the day varies in accordance with the Myanmar calendar. At the beginning of 1936, the students went on strike again. This time, after the establishment of the Yangon University Students’ Union, they were better organized. The spark was the expulsion of prominent student leaders in the 1930s, Daw Aung San Suu Kyi’s father Aung San and Thakin Nu, known as U Nu when he became the country’s first prime minister after independence finally arrived in 1948. Aung San had been expelled because he had refused to reveal the name of the author of an article titled “Hell Hound at Large,” which appeared in the student magazine “Oway.” The article was highly critical of the British rulers and it was only much later that the name of the writer was revealed: Nyo Mya, a close friend of Aung San’s. Nyo Mya went on to study journalism in England and the United States and became both a prominent author and a member of parliament representing Monywa constituency. Aung San had shown both courage and outstanding professionalism by upholding a fundamental principle that every journalist in Myanmar today should adhere to: Never reveal your sources, and protect the identity of those who want to remain anonymous. The 1936 student strike was a success, and both Aung San and Thakin Nu were reinstated. But the students pressed on, now even more vocally, calling for independence from Britain. On December 20, 1938, during a third student boycott, the movement suffered its first casualty. Aung Kyaw, a young student, was hit on the head by a baton-wielding mounted policeman and died. He was posthumously conferred the title Bo (leader), and there is a street in downtown Yangon named after him, Bo Aung Kyaw Street. Even today, Dec. 20 is remembered as Bo Aung Kyaw Day. From this and other events in 1938, there was no way back. Nothing could stop the independence movement. Unsurprisingly, independent Myanmar’s first government—and parliament—included many men and women who had been student activists in the 1930s. But independence did not mean that the student movement was dead. Shan and Kachin students met secretly at university campuses in Yangon and Mandalay, giving birth to powerful nationalist movements among those two ethnic groups. Mainstream student unions organized strikes and boycotts to press for changes in the education system and for peace in a country being ravaged by civil war. Then came the March 2, 1962 coup d’état, which terminated Myanmar’s experiment with democracy and federalism. The students were the first to protest. There were huge student-led demonstrations in early July and, on the 7th, the military opened fire. According to the government, 17 students were killed, while independent sources put the figure at more than 100. The night after the massacre, the historic Yangon University Students’ Union building was demolished—dynamited by the military. Only a monument erected in honor of Bo Aung Kyaw was spared. The military had seized power, it claimed, to “prevent the disintegration of the union.” In reality it led to intensified civil war. Many students from the various ethnic minorities joined their respective rebel armies. Among them was Sao Tzang Yawnghwe, the son of Myanmar’s first president, the Shan prince Sao Shwe Thaike. Many Burman students fled to other, jungle-clad parts of the country where they teamed up with the then fledgling forces of the Communist Party of Burma. The 1970s saw even more student unrest, first in December 1974 when the body of U Thant, the former Secretary-General of the United Nations and a critic of the military regime, was brought back to Myanmar for burial. The students seized the opportunity—and even U Thant’s coffin—to launch protests against Gen. Ne Win’s junta. Scores were killed and many survivors again took to the jungle, where they joined non-communist rebel forces led by deposed prime minister U Nu. On March 23, 1976, the 100th anniversary of the birth of Thakin Kodaw Hmaing, considered the father of Myanmar’s nationalist movement, the students demonstrated again, leading to yet more arrests. None of the movements of the 1970s, however, matched the massive student-led uprising for democracy that shook all major cities and towns in Myanmar in August and September, 1988. Today, the students who led that uprising belong to what is known as “the 88 Generation” and include some of the country’s best-known political activists. Many of them spent years in jail, some in solitary confinement, but that has only made them even more respected and popular. “Our heads are bloodied but unbowed,” has been their slogan throughout the struggle. Other, smaller student-led protests occurred in the 1990s and early 2000s while students, together with Buddhist monks, were also at the forefront of renewed mass demonstrations for democracy in August and October, 2007. Against this background, it is hardly surprising that many young protesters now feel let down by Daw Aung San Suu Kyi. In 1988, she emerged as a key leader in the movement for political and social change, but now seems to have forgotten what young people in Myanmar have been fighting for since the days of her father’s activism. It is worth remembering what Myanmar scholars Josef Silverstein and Julian Wohl wrote in a 1964 study of the country’s student movements. Little has changed since that was written more than fifty years ago and, as we have seen, Myanmar’s students have more often than not been on the right side of history. Sept. 30, 2014: The National Education Law is enacted. The bill was backed by MPs from both the ruling Union Solidarity and Development Party and the opposition National League for Democracy. Nov. 12-13: An emergency student conference convenes in Yangon where the Action Committee for Democratic Education (ACDE) is formed to lead student protests against the new law. Nov. 14-17: Hundreds of students stage a four-day protest in Yangon and call for amendment of the law within 60 days. Jan. 20, 2015: Hundreds of student demonstrators begin a march from Mandalay to Yangon. Jan. 28: President’s Office Minister U Aung Min holds preliminary talks with student protest leaders and agrees to hold four-party talks involving the government, Parliament, the National Network for Education Reform (NNER) and the students’ ACDE. Feb. 1: Four-party discussions are held in Yangon. Students table an 11-point framework for discussion and both sides reach agreement over eight points, including that talks should continue in Naypyitaw on Feb. 3. Feb. 3: The government postpones four-party talks to Feb. 12 as agreement cannot be reached over students’ attendance. Students from Pathein in Ayeyarwady Region begin a protest march. Feb. 7: Home Affairs Minister Lt-Gen Ko Ko says that student protesters are threatening the country’s stability and warns that “ex-political hardliners” and some foreign organizations are encouraging them. Feb. 12: Daw Aung San Suu Kyi meets protesters in Naypyitaw to discuss their demands. Feb. 14: After a series of talks between the government, lawmakers, students’ organizations and education advocates, an apparent breakthrough agreement is reached over a new bill, incorporating students’ 11 demands. Demonstrators marching from Dawei, Pathein and Monywa decide to cease their protests and return home. Feb. 16: The bill that was agreed upon by the four parties is sent to Parliament for discussion. Feb. 19: The main column of student protesters marching from Mandalay announce that they will stay in Letpadan, Bago Region, until March 1, pausing their protests to observe the parliamentary process. Feb. 22: Student leaders and the NNER accuse the government of violating the conditions of the Feb. 14 four-party agreement on drafting a new education bill. They say the Education Ministry circulated its own alternative draft to undermine the agreement. March 1: The Home Affairs Ministry releases a notification dated Feb. 28, calling for an end to protests as parliamentary discussions on amending the National Education Law are in progress. The notification also warns that actions will be taken against continued protests. March 3: Students at Letpadan announce they will resume their protests and attempt to march to Yangon. Authorities respond by increasing police deployment to more than 300 officers, greatly outnumbering the roughly 100 students, who begin a sit-in protest. March 5: Students and activists gather at Yangon’s Sule Pagoda to urge authorities not to launch a violent crackdown on the Letpadan protest. Riot police and dozens of plainclothes thugs violently disperse the protest. Five men and three women are arrested. They are later released and charged under Article 18 of the Peaceful Assembly Law. March 8: Students at Letpadan issue an ultimatum to authorities, asking for free passage to Yangon by March 10, at 10 am. March 10: After a week-long blockade at Letpadan, police violently crack down on students and their supporters. Dozens are injured and 127 people are arrested. Members of the media are also targeted. March 10: President U Thein Sein orders the creation of a commission of inquiry into the violent dispersal of the protest in Yangon on March 5 by police and plainclothes men, according to state-run media. March 16: ACDE student representatives attend a hearing of the Upper House Bill Committee in Naypyitaw where they discuss their 11-point reform demands. Student attendees tell the committee that all those arrested during the Letpadan crackdown should be released and the charges against them dropped. March 17: The Ministry of Home Affairs says it released 28 students and two reporters between March 12-17 who were arrested during the Letpadan crackdown. March 17: Representatives from the ACDE and the NNER put their case for amending the bill in line with the Feb. 14 agreement during the Upper House Bill Committee’s final hearing session on the law. Thet Ko Ko, Wei Yan Aung, Paul Vrieze contributed to this timeline. This article originally appeared in the April 2015 issue of The Irrawaddy magazine.